The third map by this author centers around a canyon city taken over by aliens, and it's Duke's job to get in there and exterminate them. A more ambitious endeavor than his previous maps, RazorZ expands his repertoire by creating a large open map with expansive constructions and heavy detailing made from extensive sprite work. Combined with plenty of ambient sounds, new art, strong shading, and elaborate sector work, including the detailed background work of the rest of the city burning in the distance, the player can become immersed in the atmosphere as the map is explored. 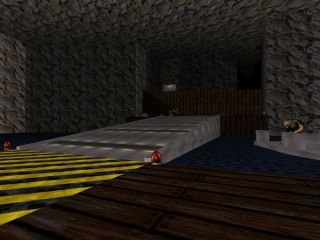 A level of this extensive size can create problems for the player though when rather clever puzzles are involved; mainly not knowing where to go next to progress. This map requires a lot of time dedicated to exploring, and then re-exploring places already visited due to the lack of clues. 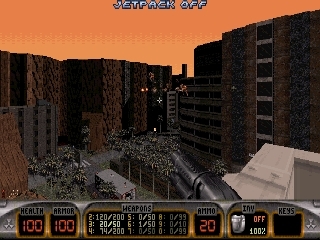 Later in the map when the player is indoors and the game becomes a bit more linear, that problem is solved, but another arises. 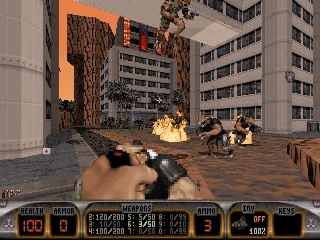 Some of the indoor battles can be quite a challenge when the player is stove-piped in a corridor and is taking heavy fire from some pretty tough enemies. The available arsenal is not the issue, Duke is armed to the nines, but health is a problem as there's a serious lack of it in this particular part of the map. Overall it's a great looking map and initially the player has the freedom to roam around at will and find all the neat hidden stashes and figure out how to get to those hard to reach goodies, but at times it can be easy to lose site of the objective. it�s time to kick some as, this is my best map show far! Janne, Jesse, Mikko Sandt, MRCK. of the episode, Resistance Rocks and Demolition Plant. the game using REZ.bat file and you can play it. they do not matter gameplay. to it�s full potential. I�m very sorry about. 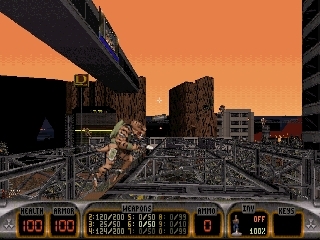 and it is not supported by 3D Realms. Page generated in 0.7671 seconds.